After seating the motherboard, it's time to install the CPU, or the brains of the computer. The processor is delicate so handle it by the edges and be sure to discharge any static electricity before picking it up. You can do this by touching a piece of grounded metal or by wearing an antistatic wrist strap that is attached to grounded metal. First, locate the socket on the motherboard. We're installing an Intel Core i7-980x and it uses what's called an LGA 1366 socket. When buying parts, make sure you buy a processor that fits the correct socket type or vice versa. On the motherboard, release the socket latch on the side, open the hinge, and remove the plastic protector. Carefully insert the processor into the socket. Be sure to orient the processor in the right direction or you could damage it or the motherboard. In the case of the i7, it can only be inserted one direction. After it's firmly seated, close the hinge and secure the latch. It may take a bit of force to close the latch, but don't worry, this is normal. Then apply thermal compound before attaching the cooling bracket to the motherboard. The Intel processor included thermal compound in the package, but we purchased Arctic Silver 5. Thermal compound is a gel that's applied to the processor between it and the heat sink. If your heat sink comes with it preapplied, remove it before using your own. After the paste is evenly applied, you can install your cooling fan bracket. Again, Intel included a cooling fan, but we purchased an after-market setup, the Arctic Cooling Freezer 7 Pro. Apply a fair amount on to the processor but not too much. Use something clean with a straight edge to smooth the paste, making sure that there aren't any gaps. The bracket goes over the motherboard socket and plastic pins are used to secure each of the four corners. Then seat the heat sink and fan straight down onto the processor. We then used a screw on each side to attach the sink and fan to the bracket. If you've applied too much thermal compound then it will ooze out the sides when the heat sink is screwed down. If this happens, wipe away the excess. 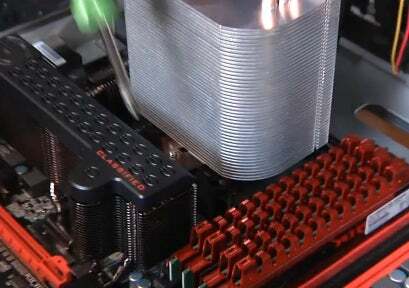 Don't forget to connect the fan's power to the CPU fan header on the motherboard. Nick Barber covers general technology news in both text and video for IDG News Service. E-mail him at Nick_Barber@idg.com and follow him on Twitter at @nickjb . In Part Two of "Build a Great Media-Editing PC" we show you just how to install the motherboard. In part 5, we show you how to connect the computer's power supply.